Become familiar with the Oracle Multitenant option. The multitenant architecture enables an Oracle database to function as a multitenant container database (CDB). The multitenant architecture solves several problems posed by the traditional non-CDB architecture. For the duration of its existence, a database is either a CDB or a non-CDB. This topic lists the most important topics for understanding and using CDBs, and includes cross-references to the appropriate documentation. 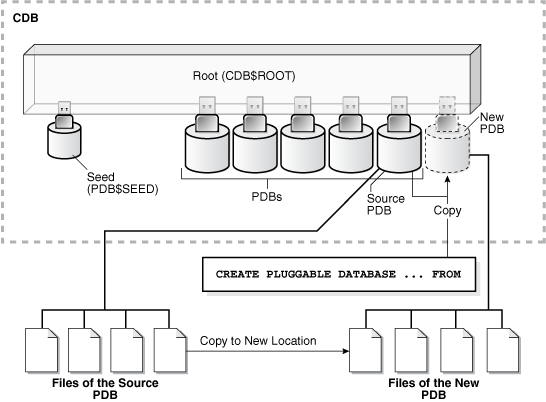 A CDB includes zero, one, or many customer-created pluggable databases (PDBs). A PDB is a portable collection of schemas, schema objects, and nonschema objects that appears to an Oracle Net client as a non-CDB. All Oracle databases before Oracle Database 12c were non-CDBs. A container is logical collection of data or metadata within the multitenant architecture. You can use the same administration tools for both CDBs and non-CDBs. The following figure represents possible containers in a CDB. 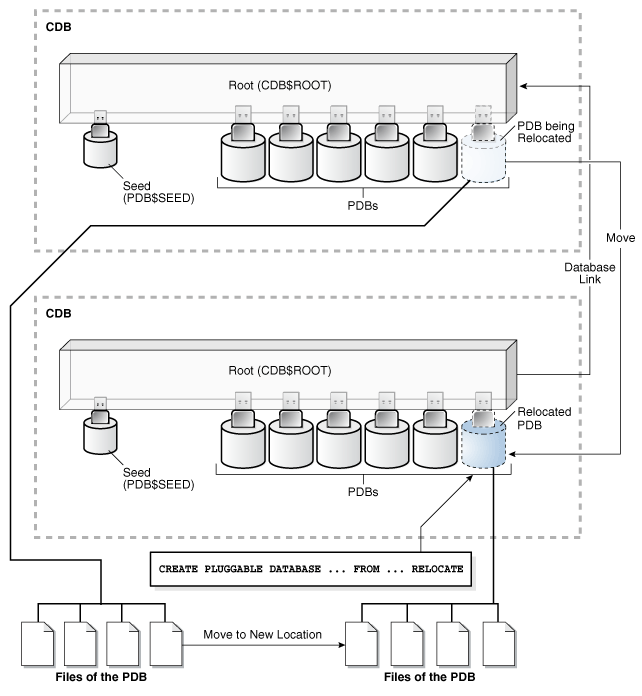 Description of "Figure 1-1 Containers in a CDB"
The CDB root is a collection of schemas, schema objects, and nonschema objects to which all PDBs belong (see "Overview of Containers in a CDB"). The root stores Oracle-supplied metadata and common users. An example of metadata is the source code for Oracle-supplied PL/SQL packages (see "Data Dictionary Architecture in a CDB"). A common user is a database user known in every container (see "Common Users in a CDB"). The root container is named CDB$ROOT. 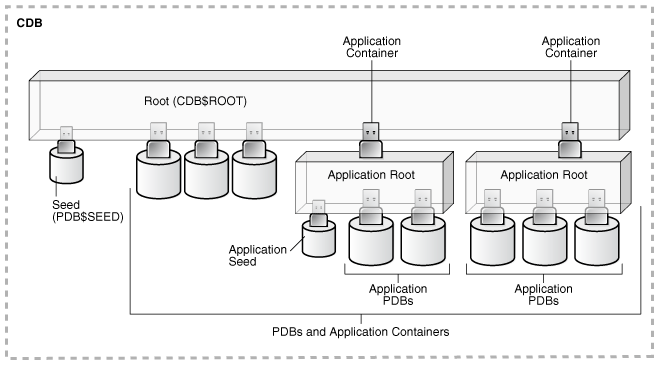 The system container includes the root CDB and all PDBs in the CDB. Thus, the system container is the logical container for the CDB itself. An application container consists of exactly one application root, and the PDBs plugged in to this root. Whereas the system container contains the CDB root and all the PDBs within the CDB, an application container includes only the PDBs plugged into the application root. An application root belongs to the CDB root and no other container. A PDB contains the data and code required for a specific set of features (see "PDBs"). For example, a PDB can support a specific application, such as a human resources or sales application. No PDBs exist at creation of the CDB. You add PDBs based on your business requirements. A PDB belongs to exactly zero or one application container. If a PDB belongs to an application container, then it is an application PDB. For example, the cust1_pdb and cust2_pdb application PDBs might belong to the saas_sales_ac application container, in which case they belong to no other application containers. An application seed is an optional application PDB that acts as a user-created PDB template, enabling you to create new application PDBs rapidly. 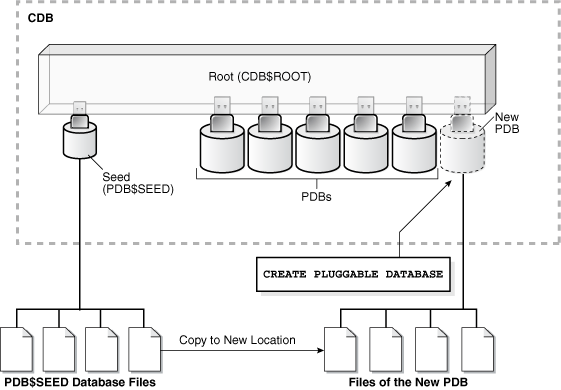 The seed PDB is a system-supplied template that the CDB can use to create new PDBs. The seed PDB is named PDB$SEED. You cannot add or modify objects in PDB$SEED. This example shows a simple CDB with five containers: the system container (the entire CDB), the CDB root, the PDB seed (PDB$SEED), and two PDBs. Each PDB has its own dedicated application. A different PDB administrator manages each PDB. A common user exists across a CDB with a single identity. In this example, common user SYS can manage the root and every PDB. At the physical level, this CDB has a database instance and database files, just as a non-CDB does. 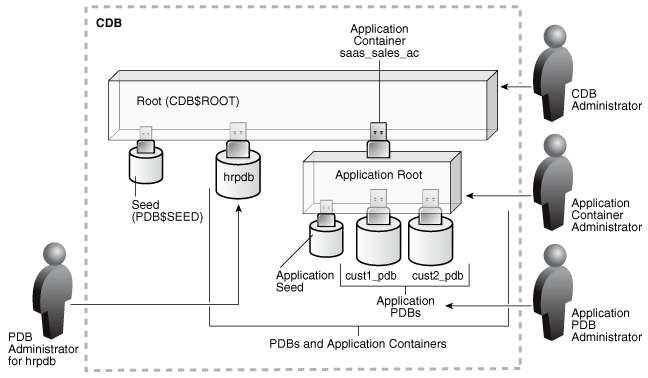 Description of "Figure 1-2 CDB with No Application Containers"
In this variation, the CDB contains an application container named saas_sales_ac. Within the application container, the application PDB cust1_pdb supports an application for one customer, and the application PDB cust2_pdb supports an application for a different customer. The CDB also contains a PDB named hrpdb, which supports an HR application, but does not belong to an application container. 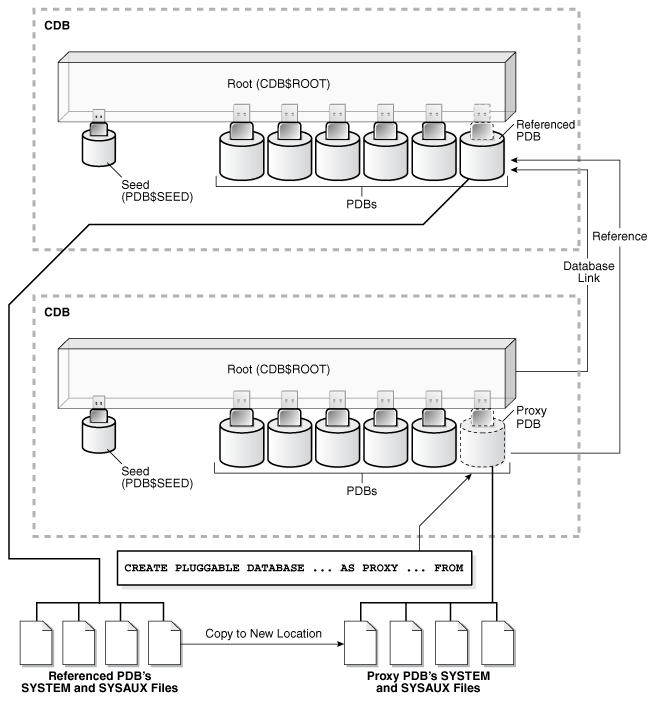 Description of "Figure 1-3 CDB with an Application Container"
A CDB administrator manages the CDB itself. An application container administrator manages the saas_sales_ac container, including application installation and upgrades. An application PDB administrator manages the two PDBs in the saas_sales_ac container: cust1_pdb and cust2_pdb. A PDB administrator manages hrpdb. "Overview of Configuring and Managing a Multitenant Environment"
SQL*Plus is an interactive and batch query tool that is installed with Oracle Database. Cloud Control is an Oracle Database administration tool that provides a graphical user interface (GUI). Cloud Control supports Oracle Database 12c targets, including PDBs, CDBs, and non-CDBs. "Administering CDBs and PDBs with Cloud Control"
DBCA enables you to create and duplicate CDBs, and create, clone, plug in, and unplug PDBs. Large enterprises may use hundreds or thousands of databases. Often these databases run on different platforms on multiple physical servers. Database consolidation is the process of consolidating data from multiple databases into one database on one computer. The Oracle Multitenant option enables you to consolidate data and code without altering existing schemas or applications. The multitenant architecture has benefits beyond database consolidation. These benefits derive from storing the data and metadata specific to a PDB in the PDB itself rather than storing all dictionary metadata in one place. Because of improvements in hardware technology, especially the increase in the number of CPUs, servers can handle heavier workloads than before. A database may use only a fraction of the server hardware capacity. This approach wastes both hardware and human resources. For example, 100 servers may have one database each, with each database using 10% of hardware resources and 10% of an administrator's time. A team of DBAs must manage the SGA, database files, accounts, security, and so on of each database separately, while system administrators must maintain 100 different computers. To show the problem in reduced scale, Figure 1-4 depicts 11 databases, each with its own application and server. A head DBA oversees a team of four DBAs, each of whom is responsible for two or three databases. Description of "Figure 1-4 Database Environment Before Database Consolidation"
In this model, you replicate the operating infrastructure of the physical server—operating system and database—in a virtual machine. VMs are agile, but use technical resources inefficiently, and require individual management. Virtual sprawl, which is just as expensive to manage, replaces the existing physical sprawl. Place multiple databases on each server. Separate databases eliminate operating system replication, but do not share background processes, system and process memory, or Oracle metadata. The databases require individual management. Separate the data logically into schemas or virtual private databases (VPDs). This technique uses technical resources efficiently. You can manage multiple schemas or VPDs as one. However, this model is less agile than its alternatives, requiring more effort to manage, secure, and transport. Also, the logical model typically requires extensive application changes, which discourages adoption. The PDB/non-CDB compatibility guarantee means that a PDB behaves the same as a non-CDB as seen from a client connecting with Oracle Net. The installation scheme for an application definition (for example, tables and PL/SQL packages) that runs against a non-CDB runs the same against a PDB and produces the same result. Also, the run-time behavior of client code that connects to the PDB containing the application definition is identical to the behavior of client code that connected to the non-CDB containing this application definition. Operations that act on an entire non-CDB act in the same way on an entire CDB, for example, when using Oracle Data Guard and database backup and recovery. Thus, the users, administrators, and developers of a non-CDB have substantially the same experience after the database has been consolidated. The following graphic depicts the databases in Figure 1-4 after consolidation onto one computer. The DBA team is reduced from five to three, with one CDB administrator managing the CDB while two PDB administrators split management of the PDBs. 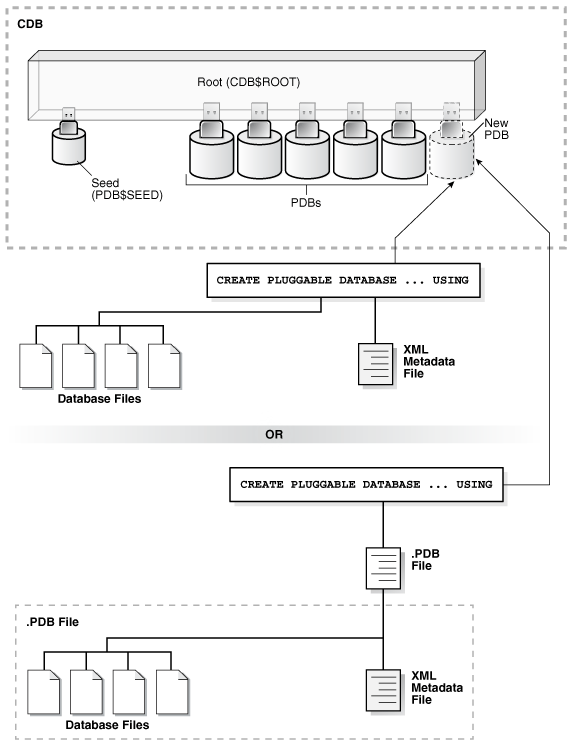 Description of "Figure 1-5 Single CDB"
Starting in Oracle Database 12c Release 2 (12.2), you can create an application container that contains application PDBs. This approach enables you to create and manage an application within this container. Most benefits that apply to consolidation into a CDB also apply to consolidation within an application container. By consolidating hardware and database infrastructure to a single set of background processes, and efficiently sharing computational and memory resources, you reduce costs for hardware and maintenance. For example, 100 PDBs on a single server share one database instance. By design, you can quickly plug a PDB into a CDB, unplug the PDB from the CDB, and then plug this PDB into a different CDB. You can also clone PDBs while they remain available. You can plug in a PDB with any character set and access it without character set conversion. If the character set of the CDB is AL32UTF8, then PDBs with different database character sets can exist in the same CDB. The CDB administrator can manage the environment as an aggregate by executing a single operation, such as patching or performing an RMAN backup, for all hosted tenants and the CDB root. Backup strategies and disaster recovery are simplified. Although consolidated into a single physical database, PDBs mimic the behavior of non-CDBs. For example, if user error loses critical data, then a PDB administrator can use Oracle Flashback or point-in-time recovery to retrieve the lost data without affecting other PDBs. An administrator uses a common account to manage a CDB or application container. Because a privilege is contained within the container in which it is granted, a local user on one PDB does not have privileges on other PDBs within the same CDB. An administrator uses a local account to manage an individual PDB. It is easier to collect performance metrics for a single database than for multiple databases. It is easier to size one SGA than 100 SGAs. It is easier to apply a patch to one database than to 100 databases, and to upgrade one database than to upgrade 100 databases. By storing its own dictionary metadata, a PDB becomes easier to manage as a distinct unit. This benefit occurs even when only one PDB resides in a CDB. Grouping PDBs into a separately managed application container increases manageability even further. For example, instead of upgrading a CDB from one database release to another, you can rapidly unplug a PDB from the existing CDB, and then plug it into a newly created CDB from a higher release. To perform load balancing or to meet SLAs, you can migrate an application database from an on-premise data center to the cloud, or between two servers in the same environment. You can flash back a PDB to an SCN or PDB-specific restore point, without affecting other PDBs. This feature is analogous to the Flashback Database feature for a non-CDB. You can define a set of application-specific PDBs as a single component, called an application container. You can then define one or more applications within this container. Each application is a named, versioned set of common metadata and data shared within this application container. For example, each customer of a SaaS vendor could have its own application PDB. Each application PDB might have identically defined tables named sales_mlt, with different data in each PDB. The PDBs could share a data-linked common object named countries_olt, which has identical data in each PDB. As an application administrator, you could manage the master application definition so that every new customer gets a PDB with the same objects, and every change to existing schemas (for example, the addition of a new table, or a change in the definition of a table) applies to all PDBs that share the application definition. In a multitenant environment, one concern is contention for system resources among the PDBs running on the same server. Another concern is limiting resource usage for more consistent, predictable performance. To address such resource contention, usage, and monitoring issues, use Oracle Database Resource Manager. 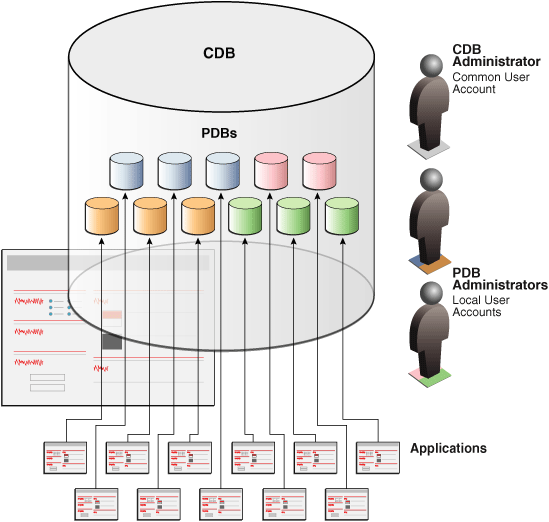 "Overview of Oracle Resource Manager in a CDB"
"Data Dictionary Architecture in a CDB"
You must define a database as a CDB at creation, and then create PDBs and application containers within this CDB. You cannot later transform a non-CDB into a CDB, or a CDB into a non-CDB. The CREATE DATABASE ... ENABLE PLUGGABLE DATABASE SQL statement creates a new CDB. The CREATE PLUGGABLE DATABASE SQL statement creates a PDB. If you do not specify the ENABLE PLUGGABLE DATABASE clause, then the newly created database is a non-CDB. In this case, the non-CDB can never contain PDBs. 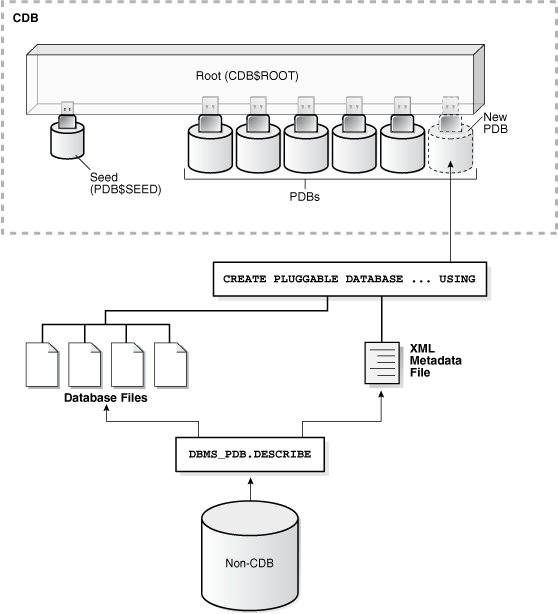 Description of "Figure 1-6 CDB with Seed PDB"
"Creating and Configuring a CDB"
The created PDB automatically includes a full data dictionary including metadata and internal links to system-supplied objects in the CDB root. You must define every PDB from a single root: either the CDB root or an application root. Each PDB has a globally unique identifier (GUID). The PDB GUID is primarily used to generate names for directories that store the PDB's files, including both Oracle Managed Files directories and non-Oracle Managed Files directories. One technique for creating a PDB is called cloning. You can create a PDB by plugging in an unplugged PDB, or plugging in a non-CDB as a PDB. To relocate a PDB from one CDB to another, use the CREATE PLUGGABLE DATABASE statement with the FROM clause and RELOCATE keyword. A proxy PDB provides access to different PDB, called the referenced PDB, in a remote CDB. "Creating and Removing PDBs and Application Containers"
You can use the CREATE PLUGGABLE DATABASE statement to create a PDB from a seed. To clone a PDB or non-CDB, use the CREATE PLUGGABLE DATABASE statement with the FROM clause. A seed is a PDB that serves as a template for creation of another PDB. Creating a PDB from a seed copies some or all of the contents of a PDB, and then assigns a new unique identifier. Every CDB has exactly one PDB$SEED, which cannot be modified or dropped. Within an application container, you can create an application seed using the CREATE PLUGGABLE DATABASE AS SEED statement, which you can then use to accelerate creation of new application PDBs. Description of "Figure 1-7 Creation from PDB$SEED"
"Creating a PDB from Scratch"
In this technique, the source is either a non-CDB, or a PDB in a local or remote CDB. The target is the PDB copied from the source. The cloning operation copies the files associated with the source to a new location, and then assigns a new GUID to create the PDB. This technique is useful for quickly creating PDBs for testing and development. For example, you might test a new or modified application on a cloned PDB before deploying the application in a production PDB. If a PDB is in local undo mode, then the source PDB can be open in read/write mode during the operation, referred to as hot cloning. If you clone a PDB from a remote CDB, then you must use a database link. If you run CREATE PLUGGABLE DATABASE statement in an application root, then the cloned PDB is created in the application container. In this case, the application name and version of the source PDB must be compatible with the application name and version of the application container. The following graphic illustrates cloning a PDB when both source and target are in the same CDB. Description of "Figure 1-8 Cloning a PDB"
A snapshot copy PDB is a PDB based on a storage-managed (not database-managed) snapshot. The PDB does not contain a complete copy of the source data files. A refreshable clone PDB is a read-only clone that can periodically synchronize with its source PDB. "Cloning a PDB or Non-CDB"
"Overview of Tablespaces and Database Files in a CDB"
If the file system supports storage snapshots, then you can clone a PDB almost instantaneously by specifying the SNAPSHOT COPY clause. In this case, Oracle Database creates a storage-managed snapshot of the underlying file system, and then uses the storage snapshot to create PDB clones. The snapshot copy PDB contains sparse files. Unlike a standard clone PDB, a snapshot copy PDB cannot be unplugged from the CDB root or application root. Also, if snapshot clones exist, then the source PDB that generated the clones cannot be dropped or unplugged. Depending on the value specified in the REFRESH MODE clause, synchronization occurs automatically or manually. For example, if hrpdb_re_clone is a clone of hrpdb, then every month you could manually refresh hrpdb_re_clone with changes from hrpdb. Alternatively, you could configure hrpdb to propagate changes to hrpdb_re_clone automatically every 24 hours. You can switch the roles of a source PDB and its refreshable clone. This switchover can be useful for load balancing between CDBs, and when the source PDB suffers a failure. An unplugged PDB is a self-contained set of data files, and an XML metadata file that specifies the locations of the PDB files. To plug in an unplugged PDB, use the CREATE PLUGGABLE DATABASE statement with the USING clause. You can move a non-CDB into a PDB. Specify the XML metadata file that describes the PDB and the files associated with the PDB. Specify a PDB archive file, which is a compressed file that contains both the XML file and PDB data files. You can create a PDB by specifying the archive file, and thereby avoid copying the XML file and the data files separately. The following graphic illustrates plugging in an unplugged PDB using the XML file. Description of "Figure 1-9 Plugging In an Unplugged PDB"
"Plugging In an Unplugged PDB"
You place a non-CDB in a transactionally consistent state, and then run the DBMS_PDB.DESCRIBE function to generate XML metadata about this database. 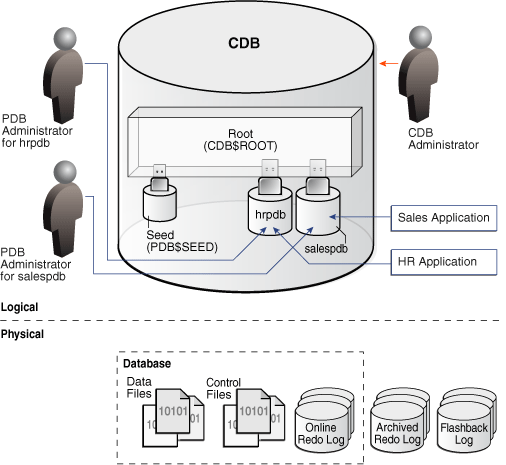 While connected to the root in the CDB, you execute the CREATE PLUGGABLE DATABASE statement to create a PDB from the existing non-CDB. Finally, to convert the definitions in the PDB data dictionary to references to objects in CDB$ROOT, log in to the PDB and run the noncdb_to_pdb.sql script. You can define a data set on a non-CDB using Oracle Data Pump. This non-CDB can be in the current or a previous Oracle Database release, for example, Oracle Database 10g. You create an empty PDB in an existing CDB, and then use Oracle Data Pump to import the data set into the PDB. A Full Transportable Export using Oracle Data Pump exports all objects and data necessary to create a complete copy of the database. Oracle Data Pump exports objects using direct path unload and external tables, and then imports objects using direct path INSERT and external tables. The Full Transportable dump file contains all objects in the database, not only table-related objects. Full Transportable Export is available starting in Oracle Database 11g Release 2 (11.2.0.3) for import into Oracle Database 12c and later. You replicate the data from the non-CDB to a PDB. When the PDB becomes current with the non-CDB, you switch over to the PDB. The following figure illustrates running the DBMS_PDB.DESCRIBE function on a non-CDB, and then creating a PDB using the non-CDB files. Description of "Figure 1-10 Creating a PDB from a Non-CDB"
"Options for Creating a PDB from a Non-CDB"
The relocation occurs with minimal downtime. The technique keeps the PDB being relocated open in read/write mode during the relocation, and then brings the PDB online in its new location. You must create a database link at the target CDB, which is the CDB that will contain the relocated PDB. Also, the source PDB must use local undo data. The following graphic depicts a PDB relocation. Description of "Figure 1-11 Relocating a PDB"
Proxy PDBs enable you to aggregate data from multiple sources. A SQL statement submitted for execution in a proxy PDB executes within the referenced PDB. A typical use case is a proxy PDB that references an application root replica. If multiple CDBs have the same application definition (for example, same tables and PL/SQL packages), then you can create a proxy PDB in the application container of the master application root. The referenced PDB for the proxy PDB is the application root in a different CDB. By running installation scripts in the master root, the application roots in the other CDBs become replicas of the master application root. To create a proxy PDB, use the CREATE PLUGGABLE DATABASE statement with the FROM clause, which must specify a database link to the referenced PDB in the remote CDB, and the AS PROXY clause. If you plug a proxy PDB directly into CDB$ROOT, then you must have created the proxy in CDB$ROOT. A proxy of an application PDB must both be plugged in to an application root. The following graphic shows the creation of a proxy PDB that references a PDB in a remote CDB. Description of "Figure 1-12 Creating a Proxy PDB"
This example creates a proxy PDB named pdb1. The referenced PDB is specified using a database link. "Creating a PDB as a Proxy PDB"
"Overview of the Multitenant Architecture"
"Creating and Removing Application Containers"
This guide is the primary task-oriented intermediate and advanced documentation for managing CDBs. This guide also contains See Also links to books that cover different CDB topics. For example, Oracle Database Utilities explains concepts and tasks specific to PDBs when using Oracle Data Pump.